This Bible verse from Galatians 5:22-23 arrives all on one piece. 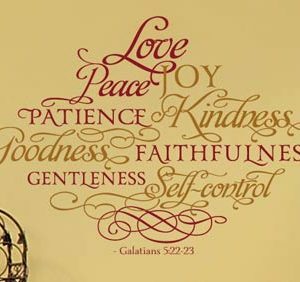 Here we have each fruit of the Spirit (love, joy, peace, patience, kindness, goodness, faithfulness, gentleness, and self-control) in alternating lettering styles. The delicate scrollwork at the end adds the perfect touch to make this design right for any room in the house. The difference that the Holy Spirit makes in a believer’s life is simply amazing! He gives you the power to do so much that you could never get done on your own: what love! 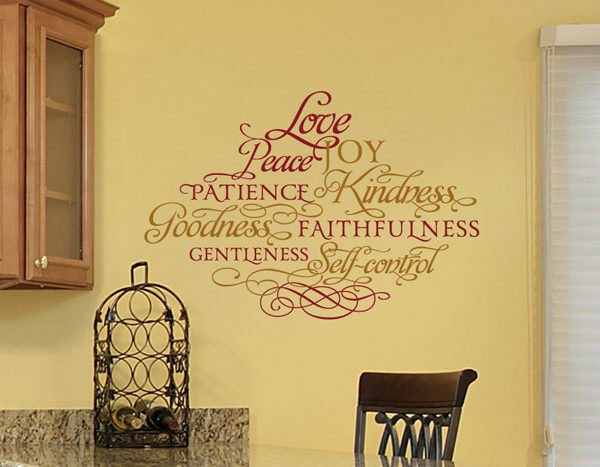 At DecorativeLettering we have ‘Fruit of the Spirit’ wall words that are suitable for all rooms. They will be an excellent reminder of what God can do in your life if you believe Him! Apply these amazing wall letters in the living room, family room, and bedroom. They will also look great in the kitchen! These two colored wall quotes arrive in one piece. The scroll work at the end gives it a stylish touch and adds glamour to any room. The diamond shape is quite eye catching and will draw the eyes to read this excellent scripture! If you are looking for wall letters that are affordable, durable and stylish at the same time, try DecorativeLettering products! Have a look at our scripture based category for wall decor that looks good and feeds your spirit man with divine food! Purchasing our wall lettering is real easy. To place your order on our user-friendly website, simply select a quote from our library. You may also submit a custom quote! Use the previewer to confirm that you have selected the right color, style, and size for your wall space. Submit and we’ll do the rest! Get in touch: it’s that simple!